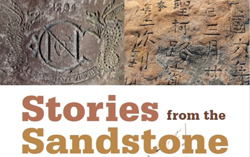 Absolutely stoked to have won, with my colleagues Peter Hobbins and Annie Clarke, the 2017 NSW Community and Regional History Prize for our book Stories from the Sandstone: Quarantine Inscriptions from Australia’s Immigrant Past. As the primary photographer of the inscriptions and quarantine station landscape on The Quarantine Project, I was especially pleased that the judges recognised the visual character of the book. Thanks go to the publisher Arbon Publishing, and in particular the commissioning editor Chryl Perry and the designer Stan Lamond for supporting our vision. A short summary of our project is available here and The Quarantine Project website has more detailed information about the work we undertook on this incredible site, at North Head, Manly NSW.